So in my continued attempt to write non-commercial fiction, I’m working on an odd little book called “Steamboat Days.” I thought my next book in the Bennett Bay series (“The Deadly Dare”) was set in a youth summer camp on the island in the middle of Lake Jackson. I ended “Return to Cooter Crossing” with Aidan and his family getting together to head down to Blackwater, the town on the lake, for some big Memorial Day weekend celebration. After which, Sean and his boyfriend Ethan would go to the camp. I hadn’t thought about what the celebration would be because it wasn’t part of the story. The “Deadly Dare” would pick up about a week later as the kids gather at camp. But it was Memorial Day weekend in real life when I started to map out the story and I started thinking about what would Blackwater do to celebrate? What did they have to celebrate? 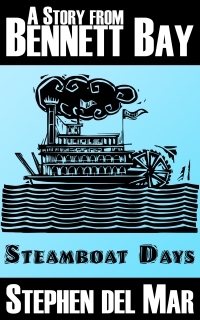 Somehow my love of old paddle wheel boats bubbled to the top as the history of the area solidified and Steamboat Days came into being. There would be music, steamboat races, a reenactment of a Civil War battle on the lake, and a big community BBQ. Something this big would attract folk from all around the county. So I thought how would my characters come and enjoy this? And of course, anytime you get the extended family together for a long holiday weekend there will be drama. First is the Quinn-Jackson-Rooney extended family. Molly and Jamie are officially moving into the Rooney family lake house, just west of Blackwater, with Jamie’s mother. The clan gathers to celebrate this and the new engagement of Aidan and JJ. The Historical Society is one of the sponsors of the event and this means Max Crawford, the director of the Society, and his partner Marcus are on hand. Max isn’t happy about this. He’s been talked into playing the role of his great-great-uncle Beauregard Crawford, the captain of the Dragon Fire, the Confederate ship in the Lake Jackson battle. There is a little bit of the paranormal from the Live Oak Tales in this story strand. The name of the boat may be a hint. Dr. Stewart Cabot, the Chair of the Anthropology Department, has decided to take the family to Blackwater for a week long vacation before his son, Ethan, goes off to summer camp. His teenage daughter isn’t too thrilled about the idea and Ethan is a little antsy. He’s missing his boyfriend Sean, who is down in Tampa with his father, and Sean let slip that he just met a hot guy that will also be at camp with them. Tony Gallo, the MC in “The Envelope” and had a walk-on in “Return to Cooter Crossing” is staying with his sister’s family and Victor Cruz, the man he’s been “dating” at the Whiskey Creek Bed and Breakfast. Victor is the MC in my upcoming book “Of Paradise and Purgatory.” We also get to meet Roxie Blue, the owner of the Whiskey Creek B&B. I’m intrigued by her. She may be getting her own series in the future. I’ll be posting occasional scenes from this story like I did with “Of Paradise and Purgatory.” If you are interested, I just added maps for Lake Jackson and Blackwater over at the Bennett Bay site.